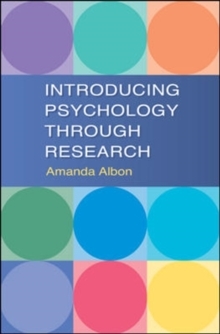 What is psychology?What constitutes psychological research?How is psychological research reported?This student-friendly textbook answers all these questions by clearly outlining the subject matter and research methods used in psychology for those who are new to the subject. A brief overview of the history of psychology is followed by chapters covering the core research areas defined by the British Psychological Society:Cognitive psychologySocial psychologyDevelopmental psychologyBiological psychologyIndividual differencesClinical psychologyEach chapter provides an overview of a major sub-discipline in psychology and introduces the key concepts in that area of research. For each topic, a summary of an original research paper is presented along with a running commentary which explains and evaluates the methods used. In order to help students, the book provides boxes, tables and glossaries of useful terms. There is also a helpful overview of the ethics of psychological research, as well as how the study of psychology might develop into a career.Introducing Psychology Through Research is key reading for first year undergraduates in psychology, those taking an elective module in psychology and those studying psychology at AS or A2 Level and considering whether to study psychology at university.